LOS ANGELES - Authorities say a burned body has been found at the scene of a wildfire that's threatening thousands of homes north of Los Angeles. Los Angeles County sheriff's Lt. Rob Hahnlein says the body was reported shortly after 7:30 p.m. Saturday outside a home on Iron Canyon Road in Santa Clarita. The fire erupted Friday afternoon in the Sand Canyon area of suburban Santa Clarita near State Route 14 as the region was gripped by high heat and very low humidity. Winds pushed it into the adjacent Angeles National Forest, scorching more than 17 square miles. Los Angeles fire officials say it is currently only 10 percent contained. Fire officials say some buildings have burned, but it's not clear whether they were homes, garages or outbuildings. Los Angeles County Deputy Fire officials say a wind shift Saturday afternoon put more communities on alert. 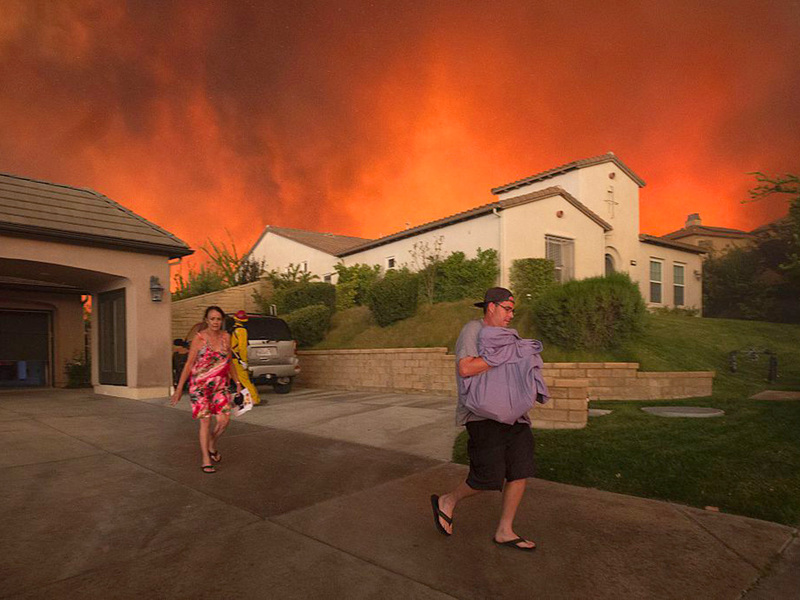 In the event of extreme fire behavior 45,000 homes could be threatened, largely in the San Fernando Valley. Authorities are preparing to lift some evacuation orders that destroyed 18 homes but are warning residents of other communities to get ready to leave. Officials said Sunday that shifting winds are pushing the flames to the northeast through Angeles National Forest and toward the city of Acton. They say some residents who fled canyons near Santa Clarita where the homes burned will be allowed to return Sunday afternoon. The blaze sparked Friday has charred more than 34 square miles of dry brush and is just partially contained. Its cause is under investigation. Some 400 animals were being evacuated from the Wildlife Waystation, a nonprofit sanctuary for rescued exotic creatures within the national forest. The sanctuary's Facebook page appealed for donations of flatbed and enclosed trucks as well as an air-conditioned warehouse to house the animals. Over many years, the sanctuary has cared for thousands of animals ranging from lions and tigers to primates and exotic birds. "There's not much you can do, is there?" Paul Kelly, an evacuated resident, told CBS Los Angeles. "You can just hope, that's all." How long will heat wave last? About 300 miles up the coast, California Department of Forestry and Fire Protection firefighters battled a nearly 3-square-mile blaze in rugged mountains north of the majestic Big Sur region. California's forestry department says the blaze is threatening 1,650 homes and other buildings and that the community of Palo Colorado is still under an evacuation order Sunday. A middle school in Carmel-by-the-Sea was readied as an evacuation center. More than 300 firefighters were on the lines. One firefighter has sustained minor injuries, CBS Los Angeles reported.